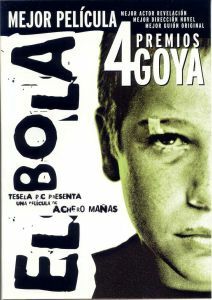 El Bola (Pellet) (Director: Achero Mañas, Spain, 2000): Pablo’s nickname is Pellet, hence the title of this film. I didn’t know anything about this film before popping it in the DVD player, so I had no idea what kind of a ride I was in for. The ride was great. Performances are authentic and at times, appropriately subtle. The actual subject matter doesn’t arise until almost halfway through the film; a style that doesn’t always work, but definitely does here. Pellet loiters around town with some of his misfit, daredevil peers and befriends the new kid at school, Alfredo. Alfredo provides Pellet with a simple camaraderie that Pellet seems to never have known before, and he is obviously needy for this kind of friendship. Still, he initially feels out of place in certain situations, such as spending time in Alfredo’s family environment; granted, Alfredo’s family environment may not be the most “normal”, but we soon see why Pellet is tentative. The film touches indirectly on a lot of themes and situations that are not very developed, but I appreciate the realistic snapshot of time-and-place that this method provides; they also work to advance characters rather than plot. We never really get the story on some of the supporting characters but it ends up not really mattering; somehow the subtle oddities of certain people and events gives the film a “truth is stranger than fiction” sort of backdrop. I was very impressed with the lead actor Juan José Ballesta, who played the title character at only thirteen years of age. I didn’t recognize him at first, but later realized that I saw him in person a couple of years ago at TIFF when he was in town to promote the film 7 vírgenes. 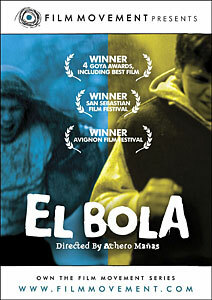 El Bola is a powerful film that deserves the many awards and nominations that it received. It is a moving story that is painful at times and heartwarming at others. It authenticates itself through its photography, characters, performances and sadly, the story itself. I think that Jay would consider this to be a “Jason Chu film”, so it’s no surprise that many moments of it recall Truffaut’s Les Quatre cents coups (The 400 Blows). Note: Film Movement featured this film as their Year 1 Film 1. That’s right, it was their very first pick. As an added bonus, the film is on sale right now for half price, making it a bargain even for non-subscribers to Film Movement’s service. This entry was posted in DVD, DVD Clubs, Film Movement and tagged adolescence, DVD, DVD Clubs, family, Film Movement, spain. Bookmark the permalink.